Sometimes I don’t understand this truth. Even if its true. Nothing in this life from the outside will tell you God is good. In fact, some days I can the the skeptic’s and atheist’s points of view. If all you see, with a dead heart and dead eyes is the surface, then yes. God cannot be good. Or if He is good, He cannot be all-powerful. So how do we, as alive and awaken soul-believing people hang on to the truth : God is Good and God is all- Sovereign ? The cross. Even the cross, on the surface without the resurrection’s story ending tells me nothing but defeat. With Easter coming up, I’ve decided to focus and meditate on the cross and the suffering. Maybe because in the past few years I’ve seen a lot of suffering, both mine and in others. Babies gone. Husbands leaving. Wives dying. It all seems unfair and I wonder, in the darkest ninth hour, how can God be good? Really…. So then I look at the cross. Jesus was human and in anguish – felt the grief of God’s back on him. The silence of God was felt on the cross. Our Savior suffering physically, but emotionally as well. In the depths of suffering, Jesus endured. Endured the cross. Why? In the end, Jesus asked God to even forgive those around him. So in the end, Jesus still believed. In the deepest, darkest hour when He was all alone, with no help, Jesus felt forsaken by God, but didn’t stop believing God was good. He didn’t stop believing in the forgiveness of God. Jesus felt forsaken by God, but didn’t stop believing God was good. He didn’t stop believing in the forgiveness of God. If I am to become more and more like Christ, then in my sufferings I can even look to Him. The joy was in the future. It wasn’t tangible but it was promised so hope lived in our Lord’s heart on the darkest day of history. Why would God hurt the Son He loved so well? Although He asked for the suffering to pass, He resigned to do the will of God, even if meant the punishment of all of sin upon his heart. For the joy. The joy of what? Of me. The joy of the resurrection. The joy of Kingship on the Throne. When I want to look around for inspiration in my suffering, may I never look anywhere but the cross. If my Savior is my representation, I can endure. I can resign. I can hope with assurance for the joy to come. I’m struggling today to hold on to this hope. Some days are better than others, but it doesn’t matter my hope or my faith. The ultimate freedom from sin. The street of gold leading to a throne. The music of an angel chorus praising the One who died for me. Those are the promises of the cross waiting for me in heaven. What about right now? When babies die, starve, and mothers cry in the dark? What if our ordinary is just so hard? How is God good? Many times I miss the goodness of God because I’m looking around instead of up. Or, I’m missing the unseen places. I forget God is working on the hearts of my children, even when I mess up. I forget God is planting seeds of faith in believers and even unbelievers as I walk through life sharing my testimony. I forget about eternity when I lose sight of God’s goodness. The cross this Easter season has taught me sometimes we miss the truth, just like the disciples missed the resurrection promises made over and over again. 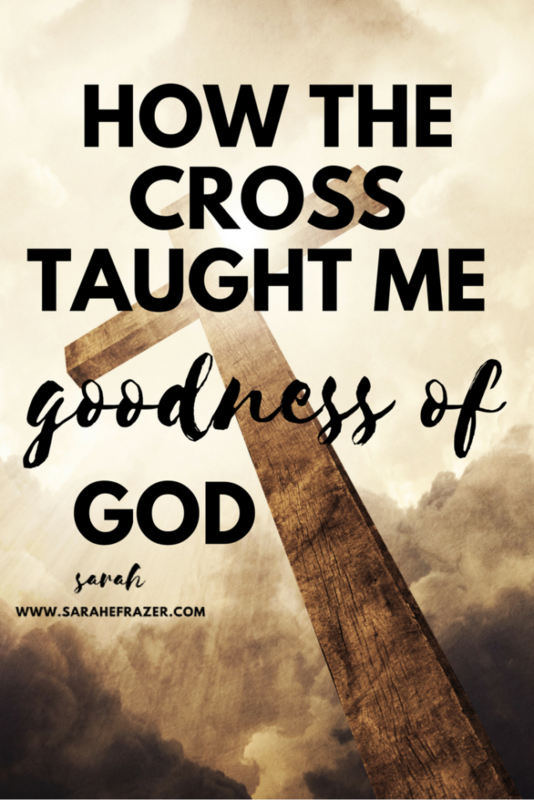 The goodness of God is ultimately not in the death (although there is goodness there), the cross taught me sometimes we must endure a season of night before we see the light. That’s ok. So did Jesus. If anyone knows anything about suffering it is Jesus. And He took ALL of our sins so that we might have the righteousness of God. The goodness of God comes in the promises of cross. Because of Jesus’ death and resurrection, I have obtained the righteousness of God, sonship, forgiveness, freedom, joy, and true love. That is the goodness of God.